By Kori ~ December 5th, 2011. In 2005, we took the trip of a lifetime to Australia. We fell in love with the country, the people, and the wine. While Australia is quite versatile in the number and quality of wines it can successfully produce, it is best known for Shiraz. Many people mistakenly think Australia is a newcomer to the wine production business because their imports to the United States have only exploded since the 1980â€™s. However, when you visit Australia, you quickly realize that the wine industry there is actually older than in the United States when you see winery cornerstones dated from the 1840â€™s and 1850â€™s. In fact, Australia has some of the oldest continuously producing vineyards in the world, some over 100 years old. The reason for these ancient vines is that Australia has been free from phylloxera, the pest that ravaged the vineyards of France and California making it necessary to replant vines in those areas by grafting onto phylloxera-resistant rootstock. After we posted about our Digging into the Cellar Party featuring Australian Shiraz from the 2005 vintage, we received a shipment of current releases of Australian Shiraz to restock our cellar. Rather than holding onto them for a while, we put them into one of our regular blind samples tastings to see how the current vintages are showing. Overall, it was an excellent set of wines. 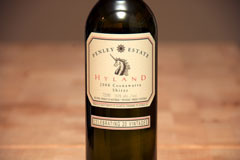 The 2008 Penley Estate Hyland Shiraz was outstanding and our clear favorite. However, it was followed closely by the 2008 dâ€™Arenberg The Love Grass Shiraz and the 2009 Innocent Bystander Syrah. 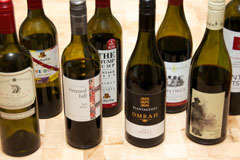 In addition to being wines of high quality, these Australian Shirazes also deliver outstanding value. Six of the eight wines received a QPR rating of 5 bangs for your buck. Any of these wines would be great choices to put in your own cellar or to give as a gift this holiday season. 2008 Penley Estate Hyland Shiraz (Coonawarra, Australia): Deep, dark purplish red. Nice nose with spice, blackberry, and peppermint aromas. Blackberry, black cherry, black pepper, mint, and chocolate come through on the palate. Full-bodied and lively with velvety tannins. Well-balanced with a long, lingering finish. 2008 dâ€™Arenberg The Love Grass Shiraz (McLaren Vale, Australia): Dark, dense purple in color. Nice nose with ripe black fruit aromas. Blackberry, black cherry, black pepper, and chocolate come through on the palate. Full-bodied with lively acidity and chewy tannins. Big and bold, yet extremely well-balanced, with a very long finish. 2009 Innocent Bystander Syrah (Victoria, Australia): Dark, dense purple. Aromatic with smoke and game on the nose. More smoke and game as well as licorice and black fruit comes through on the palate. Medium to full-bodied with lively acidity and high, drying tannins. Well-balanced with a long, lingering finish. 2008 Plantagenet Omrah Shiraz (Great Southern, Australia): Deep, dark purple in color. Aromatic with black fruit, oak, and a touch of earth on the nose. Fruit-forward with blackberry, black cherry, and a hint of smoke on the palate. Medium to full-bodied with lively acidity and medium to high tannins. Well-balanced with a long finish. 2008 Plantagenet Hazard Hill Shiraz (Western Australia, Australia): Medium deep red. Nose is a bit tight at first, then oak and black fruit comes through. Black pepper, spice, black fruit, and a hint of leather on the palate. Medium to full-bodied and lively with medium to high tannins. Well-balanced with a long finish. 2008 dâ€™Arenberg The Stump Jump Shiraz (McLaren Vale, Australia): Deep, dark purple. Very jammy with black cherry and spice on the nose; blackberry, black cherry, licorice, and a hint of black pepper on the palate. Medium to full-bodied with lively acidity, medium to high tannins, and a long finish. 2008 Zonteâ€™s Footstep Baron Von Nemesis Shiraz (Barossa Valley, Australia): Deep, dark purplish red. Aromatic with thick blackberry liqueur on the nose. Blackberry, oak, and a hint of leather comes through on the palate. Medium to full-bodied with lively acidity, medium tannins, and a long finish. 2008 Leeuwin Estate Siblings Shiraz (Margaret River, Australia): Deep purplish red. Nose is a bit tight at first, then black fruit comes through. Jammy with blackberry, black cherry, and spice on the palate. Medium to full-bodied with lively acidity, medium to high drying tannins, and a long finish.